A special today, a call for a quickie ballast train. Just wait for a phone call first thing, after Dave has checked that we can see the track at all. We could, the snow has mostly blown free. Ballast will not run out of the Dogfish if frozen, but we reckoned if we loaded and dropped it the same day, we should be OK. And there are only 2 days before the first (volunteer) special train, so we need to get our skates on (if you see what we mean, we are not in Holland here). At Stanton Stevie was filling the Dogfish in whole and part loads. More ballast was due later in the day, in case we decided on a second drop. The snow was the same as before - deep here and there, absent in other places, not too bad really. With the hoppers full, we climbed on board the ED and propelled out to Peasebrook. Nice and warm in the cab there, absolutely freezing wind outside though. 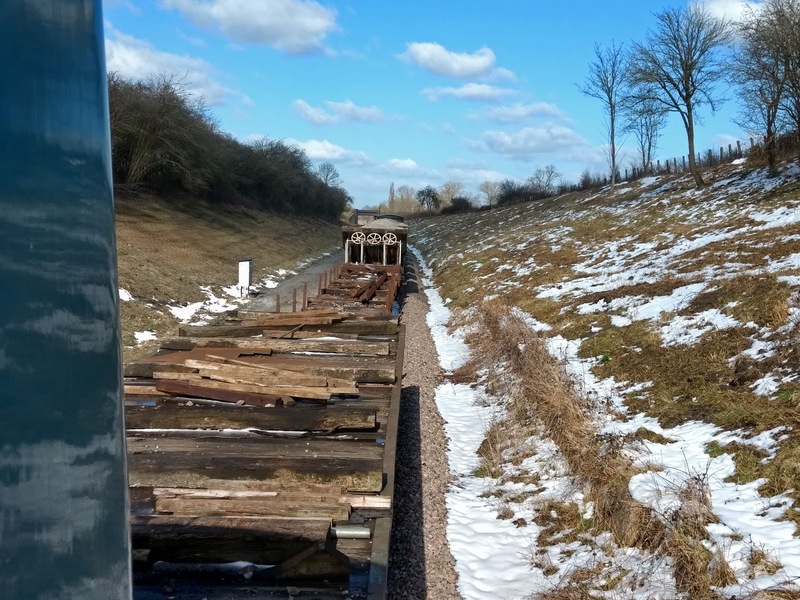 Due to insufficient ballast here initially, and the subsequent tamping/lifting activity, the sleepers ends are visible here over about 100 yds. This gives no sideays support to the track, which is continuously welded here. You can see the sleeper ends sticking out in the picture. The handwheels on Dogfish are stiff in the best of times, but today was really tough. We needed a side drop, whereas previously centre drops had been made, so the wheels for the sides had not moved in quite a while. Plus, it was freezing outside, and this embankment is probably the coldest place on the whole railway. It's windy! Well, we got this wagon open, so here goes. The icicles under this chute give you a demonstration of the temperature this morning. We got the wheel turning on a second wagon, but nothing happened! We gave it a 'rough shunt' but still no joy. It seems while the ballast was certainly loaded today, it was from the existing pile and this was ice cold inside, and full of blown snow. 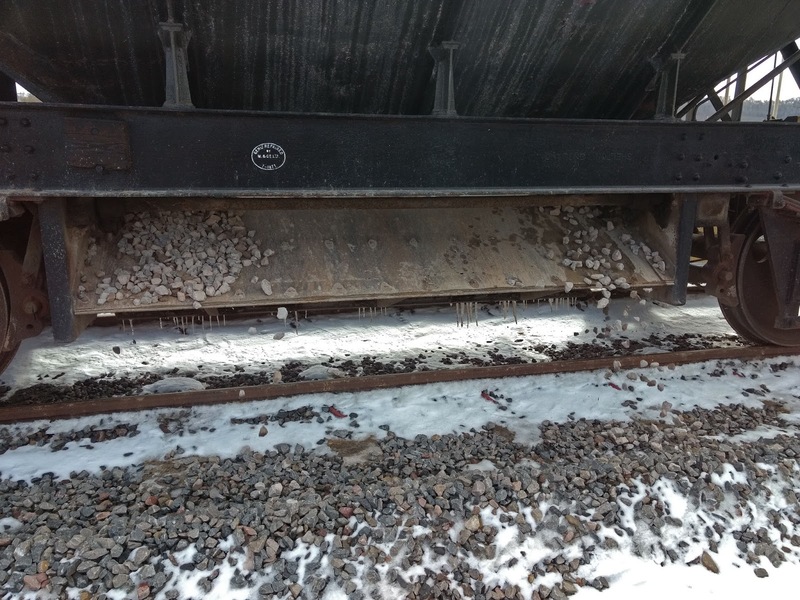 From an investigation of another part empty hopper we could see that the snow had collected near the bottom, with the top of the load dry. We emptied what we could, and repaired back to Stanton for a reload, this time with ballast delivered the same day. While Stevie worked hard in the digger, the droppers repaired to a local hostelry and consumed hot, warming curries. Just the thing. After lunch, up to the Childswickham Road bridge, where there was a slight dip and some more shoulder work needed. If you can read this, you will see that we have a staff for the section now! It's true then, we are going from Toddington to our new station at Broadway. The drop in the afternoon was much easier, and we achieved what we set out to do, reinforcing the two thinner sections identified. The newly delivered ballast flowed just fine. We also took up some bogie flats, which will be used in a sweep up train later on. 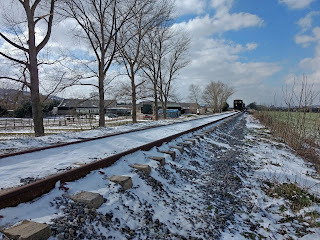 The wagons were parked at Broadway north, ready for next time, with one frozen load still intact. Yes, we did remember to close the hopper door again. We trundled through Broadway, where we were cheered by a small gang. On the return, we had a non-stop run from Broadway north down to Stanton. Could have filmed that, for the driver's eye view fraternity, but the ED windscreen is a bit fly blown. Maybe next time. At Broadway itself several large loads of aggregate have been delivered. 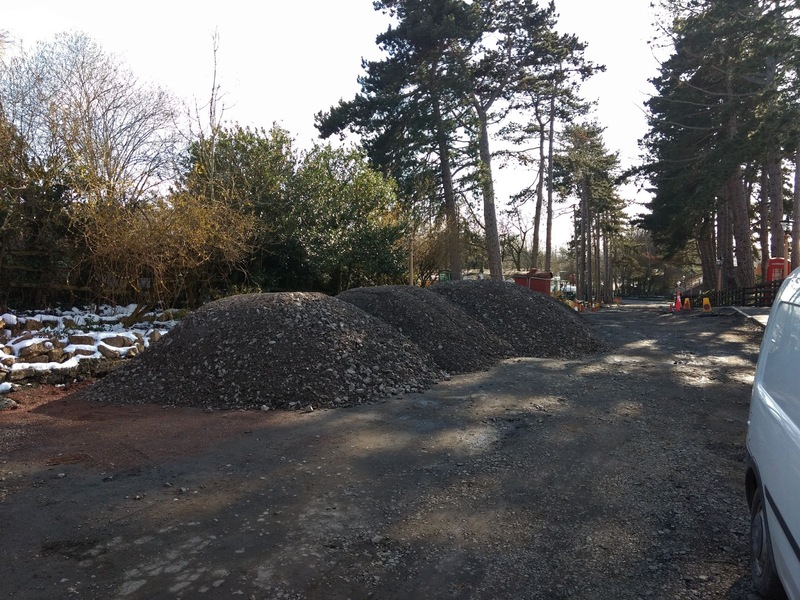 More work for Stevie - this will be spread out over the station approach to make it a bit more presentable for opening day. It's not wasted, we need infill here in any case. We made use of our visit to Broadway to hand over the replica door plates made specially for the station. All but one have the pre-grouping moulded rim (later it became plain). We leave you to hunt out the one that is a bit more modern. Don't tell though, it's the best we could do. These plates are hard to find and need a lot of time and patience. They are all replica castings, so not worth collecting, we should warn. 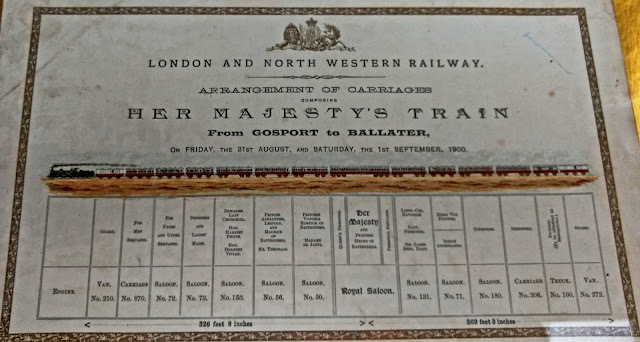 The TICKETS plate was found in the estate of one of the original founders of the GWSR in Willersey. You have to ask yourself, where did he get it from? 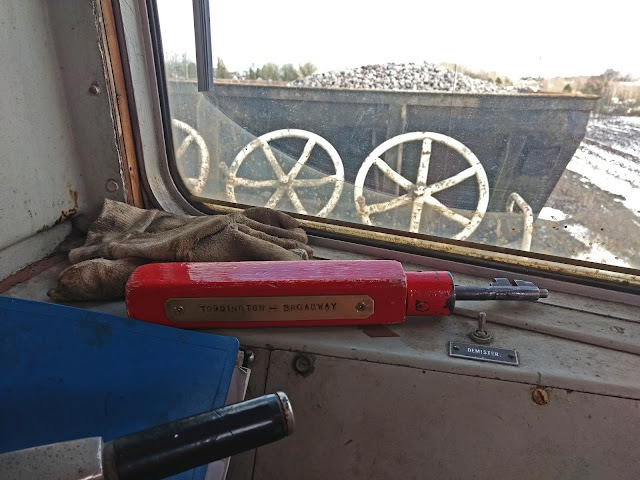 Which is the nearest station to Willersey Halt that had a ticket hatch? The 'IN' was a donation, and was used by the little foundry we use to make a sister 'OUT'. More plates will arrive tomorrow, to cover each door in the building. 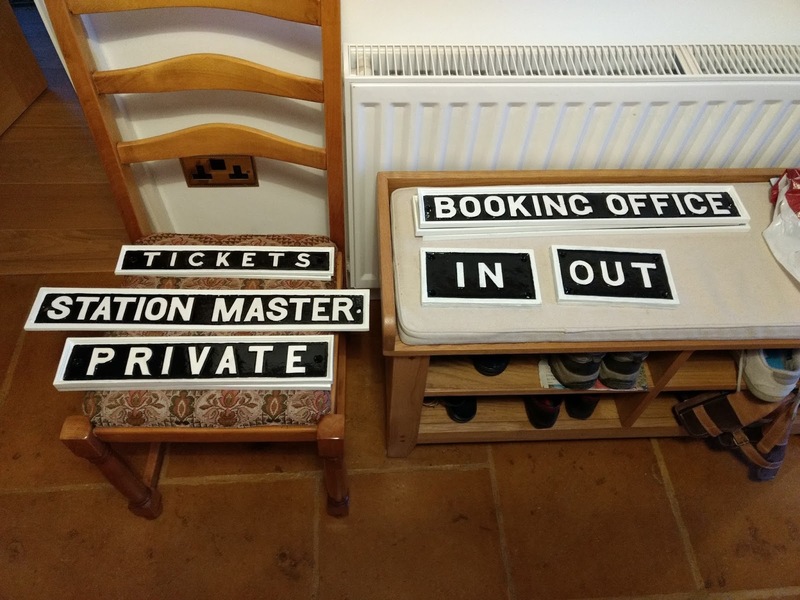 While on the subject, since the GWSR has no genuine cast iron BEWARE of TRAINS notices anywhere, we decided to have replicas cast. For some reason they are quite hard to find, so if anyone else has experienced this and would like one, we might be able to arrange more. The first 8 are being delivered later this week, 4 for Broadway and 4 for CRC. 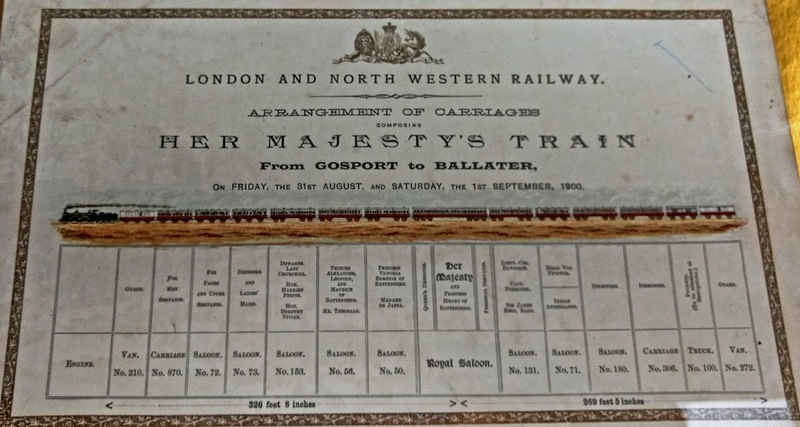 It's the composition of the royal train from Gosport to Ballater at the end of August 1900. If you click on the image, you may be able to make out who travelled in each of the 14 vehicles, with HER MAJESTY in the long three axled bogie in the middle. The engine, however, is not further identified, although each carriage is. What a piece of history from times gone by. Whilst discussing GW signs in general and those under scrutiny in particular, eBay is often a good place to browse through if a particular sign is needed. A Beware of Trains is currently up for sale at £28 -is there any cross over taking place between the repro versions you mentioned and the several examples on eBay? I like accuracy and authenticity but I am not a purist. 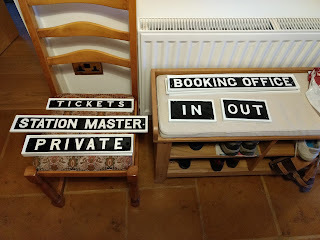 If signs are that valuable there is not much point in leaving them unattended in public areas such as railway stations for Fred the Thief to help himself, is there? Please let me know how many such signs you need at Broadway and I will be happy to fund them. Always worth shopping around. The examples on Ebay are reproductions of Midland ones (without having seen the one you mean, but the price tells me that). I followed Ebay for quite a while, and never saw a GWR example. The ones we have commissioned will be bolted to a bullhead rail post with one way bolts, so cannot be stolen. As a general rule, we do not put genuine railwayana in public spaces. Another unexpected blogpost ! On a Monday ! Jo is a very surprising man. My word, you've a lot on, haven't you ? And in this weather ! Just as well the platform at Broadway was seen to, before the snow returned. I'd no idea the snow had persisted in your area. Here n the North West, there's no sign hat any snow ever fell ! Oh yes, it's cold, all right. 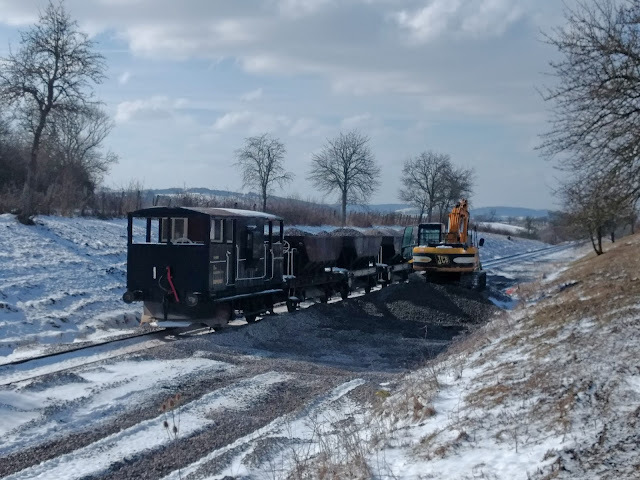 Well, I hope the residual snow did not make things too difficult with the ballasting. Many thanks for the latest update. 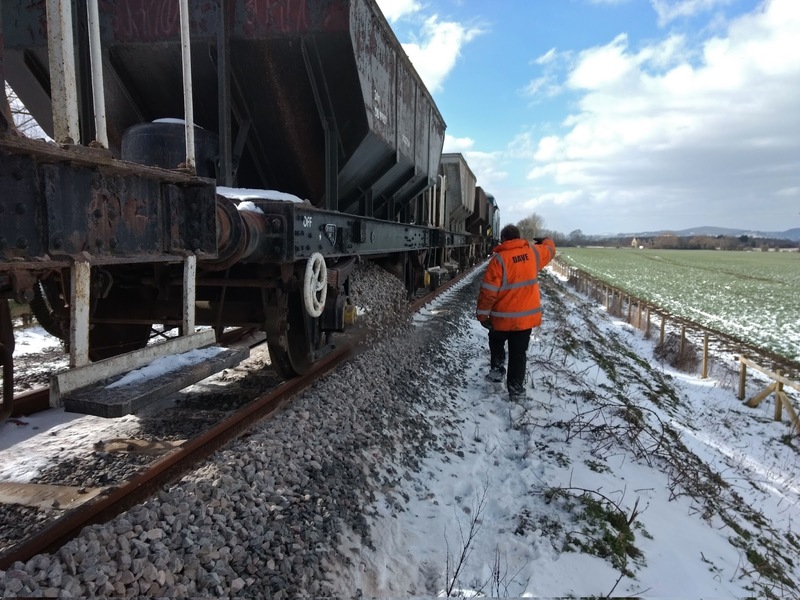 I know time is short but I must praise your efforts with the ballast drop today; I've walked that section many years ago (GWSR sponsored walk I think) and it was cold and windy, even on a relatively mild day! Very interesting update on the "Beware of Train" signs too, as they appear to be very similar for all railway companies but are not, hence the need for "genuine" GWR ones. I'd quite like one myself! Maybe something for later this year. Bbrrrr..... It makes me feel cold, and I am in central heated luxury. Well done ballasting in the current weather. I have removed a comment that was posted anonymously. I would like to offer assistance on the purchase for the interested items on auction. Is there a way to bid on them remotely? 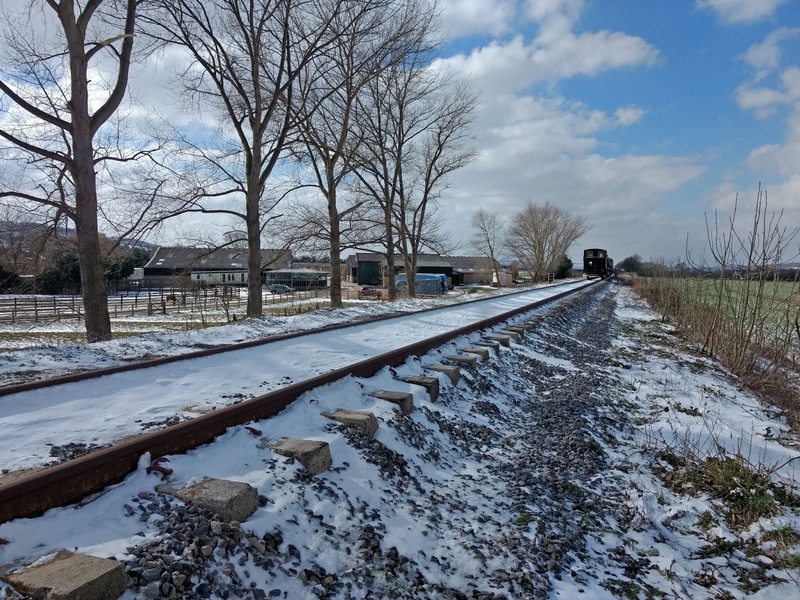 Jo, thanks for the impromptu report, the ballast train in the snow picture could be in Siberia! Also just seen the chocolate and cream set in Broadway on the security camera, what a magnificent site to see, just wish I could get a continuous live feed from the camera rather than coming out then back in again after every couple of minutes, or am I doing something wrong? Yes, I saw that, too. Chocolate and cream coaches in Broadway ! But didn't see the engine. As Paul rightly says, a continuous live feed would make all the difference ! VERY pleased to see one of the signs I donated some time ago being put to good use - much better on Broadway station than hanging on my garage wall. Well Done - it all looks fantastic - can't wait to visit - on a train!! !